unpaginated with diagrams. Octavo (8 ¾” x 6 7/8”). Bound in red cloth with gilt lettering to spine and front cover. Supplement laid in. 1st edition. Jose Raul Capablanca was born in Havana, Cuba on the 19th of November 1888. He learned chess at the age of four by watching his father play and in 1901, at the age of 12, he beat Juan Corzo, the Cuban champion. Capablanca was regarded as the most naturally talented chess player anyone had ever seen. He was educated in America, studied engineering at Columbia University and spent much of his free time playing masters at the Manhattan Chess Club in New York City, where he achieved a sensational win in a match against US Champion Frank Marshall crushing him by 8 wins to 1 with 14 draws in 1909 when he was 20 years old. Frank Marshall had unsuccessfully played Lasker in a World Championship match only two years earlier. In 1911, on the insistence of Marshall, Capablanca played in San Sebastian, Spain at one of the strongest tournaments in the world at that time. He astounded everyone by taking first place at this tournament with a score of 6 wins, 7 draws and 1 loss ahead of Rubinstein, Schlechter and Nimzovitsch. This was his first major tournament, an achievement he shares only with Pillsbury. In 1911 Capablanca challenged Lasker for the world championship. Lasker agreed to the challenge but imposed 17 conditions for a future match. Capablanca disagreed with these conditions and the match did not take place. In September 1913 Capablanca secured a job in the Cuban Foreign Office. He had no specific duties but to play chess. In 1914 at a tournament in St. Petersburg Capablanca met Lasker over the chessboard for the first time. Capablanca took the lead by one and a half points in the preliminaries but lost to Lasker in the finals. Capablanca finished second to Lasker with a score of 13 points to Lasker's 13.5. The war interrupted European chess for four years. After the war Lasker's heart was not really in chess. His efforts to secure proper financial rewards for chess masters had failed and great players were still dying in poverty. He agreed to defend his title against Capablanca in 1920 but resigned his title in favor of the challenger as he no longer felt like struggling. He told Capablanca, "You have earned the title not by the formality of a challenge, but by your brilliant mastery." However, there was pressure from the chess world for Lasker to play Capablanca and when Capablanca found sponsors in Cuba who were prepared to finance the match for twenty-five thousand dollars of which half would go to Lasker whether he won or lost he decided to go ahead with the match. However, Lasker maintained that as he had resigned the title already it was he who was challenger to Capablanca. In Havana in 1921 the match went ahead but it was a great disappointment to chess fans. Although thirty games had been planned the match lasted for only fourteen after which Lasker was losing by four games to none with ten draws. He resigned the match on grounds of ill health. Capablanca was now the new World Champion. In December 1921 he married Gloria Simoni Beautucourt. They had a son, Jose Raul in 1923 and a daughter, Gloria in 1925. At this time in the history of chess there was an increasing number of strong chess players and it was felt that the world champion should not be able to evade challenges to his title as has been done in the past. In London in 1922 the greatest players of the time including Alekhine, Bogolyubov, Maroczy, Reti, Rubinstein, Tartakower and Vidmar, met to discuss rules for the conduct of future world championships. 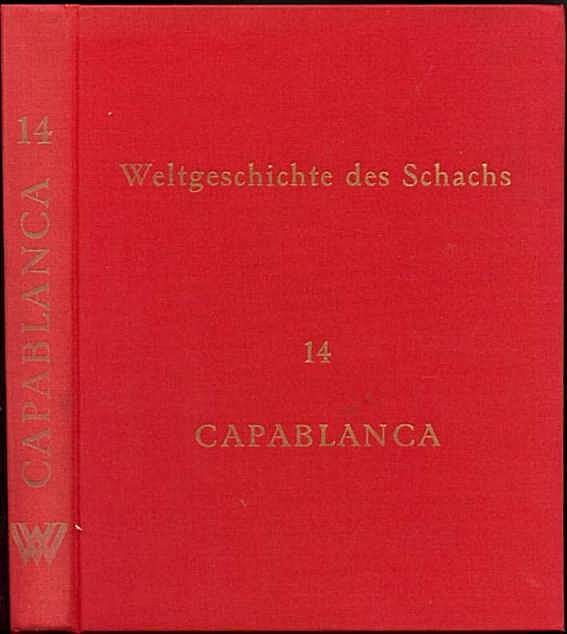 Amongst other things, one of the conditions, which was imposed by Capablanca, was that the challenger would have to raise at least ten thousand dollars for the prize money. In the following years, Rubinstein and Nimzowitsch challenged Capablanca but were unable to raise the necessary ten thousand dollars. Then came Alekhine's challenge backed by a group of Argentinean businessmen and the president of Argentina who guaranteed the funds. However, Capablanca imposed another condition. He replied that if Alekhine wanted to be considered as a challenger then he would have to play in a tournament in New York. The winner of this tournament would play Capablanca in the next world championship. This outraged Alekhine who had gone to a lot of trouble to find sponsors to back him. Capablanca had put another hurdle in his way. Beside this, it seemed that Capablanca had selected players for the tournament who had never before beaten him in even one game. They were Nimzowitsch, Vidmar, Spielmann and Marshall. Capablanca easily won this tournament and Alekhine came second. Alekhine had qualified to challenge the world champion. Perhaps because Capablanca had won this tournament so easily he had became dangerously complacent. The World Champion match was held in Buenos Aires in 1927. The first to win six games would be the new World Champion. This match was the longest World Champion match there had ever been. It lasted thirty-four games and seventy-three days but eventually Alekhine achieved a score of six wins to three to secure the title of World Champion. A personal feud had grown between Alekhine and Capablanca with Alekhine refusing to play in the same tournaments as his old rival. At the Nottingham tournament in 1936 when the two men did meet they were never seen seated together at the board for more than a few seconds. Each man made his move and then got up and walked round. Capablanca died of a stroke in New York in 1942. Upon Alekhine's death four years later it was discovered that he had been working on a collection of Capablanca's best games and in the introduction he had written, "With his death, we have lost a very great chess genius whose like we shall never see again." Corners bumped, lightly soiled. A very good copy.